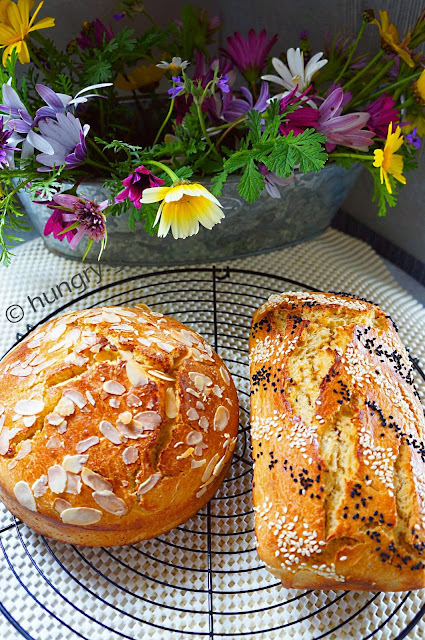 Easter buns without kneading with easy and simple process of "sleep bread" of Focaccia. The waiting time to activate the yeast is higher, but it all happens during the night, with the dough in the fridge "sleeping", and only the next morning you make in braids or buns put small stick forms. This fermentation process has the effect of improving and enhancing the taste. The addition of spices makes them particularly fragrant and delicious. And the honey makes them mildly sweet, fluffy and very soft. If you like the idea, the process will delight you, as the result too. From the previous evening we begin the process of dough. 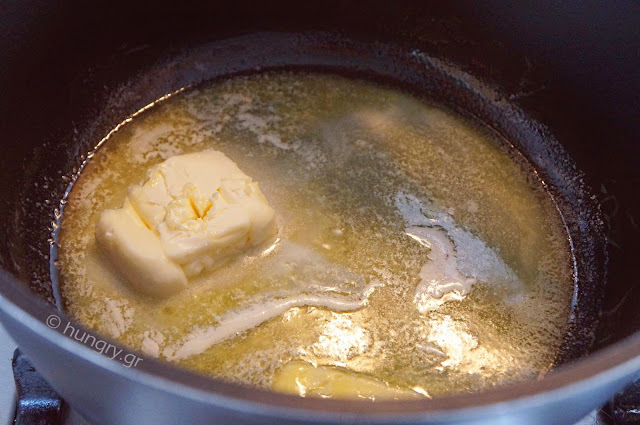 In a saucepan, over low heat, add the butter to melt, without burning, and immediately add the milk and let it become lukewarm. 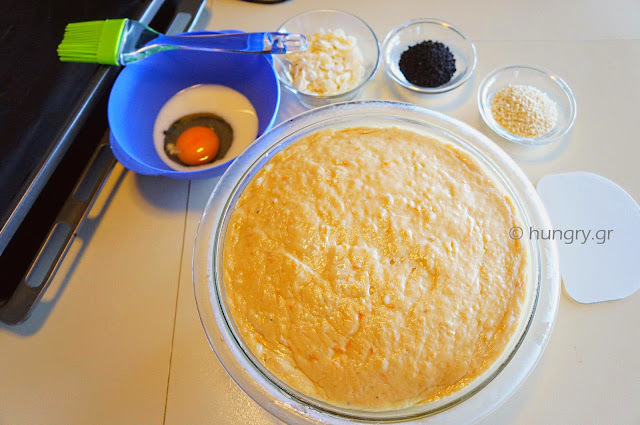 Continue adding the flour, yeast, salt and eggs. 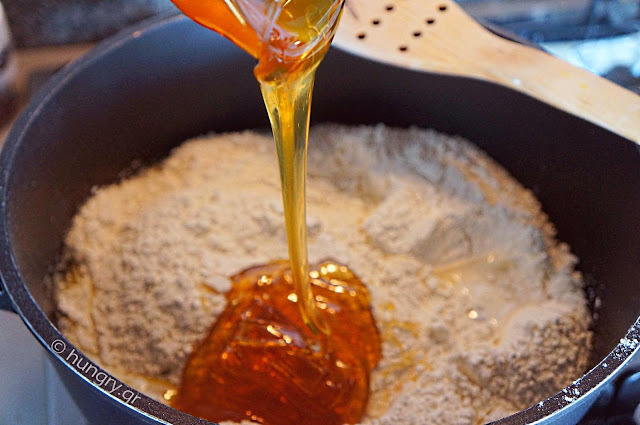 Pour honey and mix by hand to get a sense of the temperature, which should not rise above 35°C (95°F), gently warm. At about human body temperature. 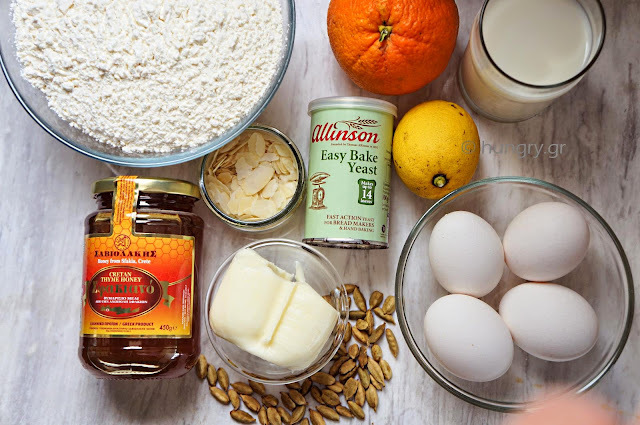 Mix well until completely homogenized components and has been incorporated into extended flour. We can do the same process with a wooden spoon, enough to have under control the temperature. 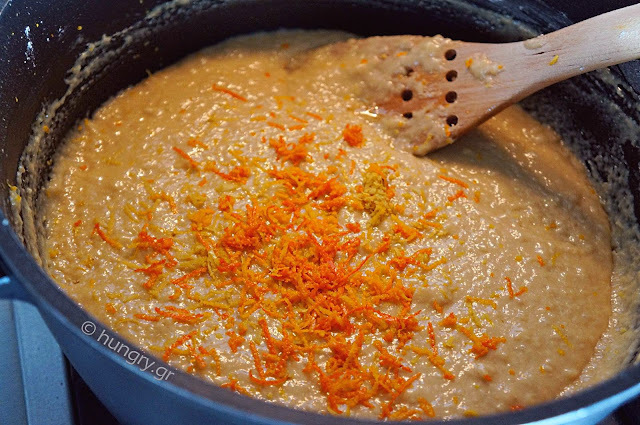 Finally add the aromatic spices and lemon zest, orange. 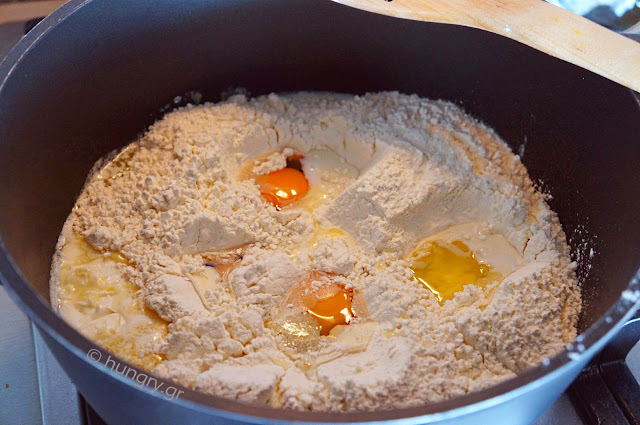 If necessary add a little flour that help the dough unsticks from the sides of the pot. The dough will be sufficiently soft and sticky. Remove the pan from the fire, cover and let it at a warm place for 2 hours until the dough to rise. 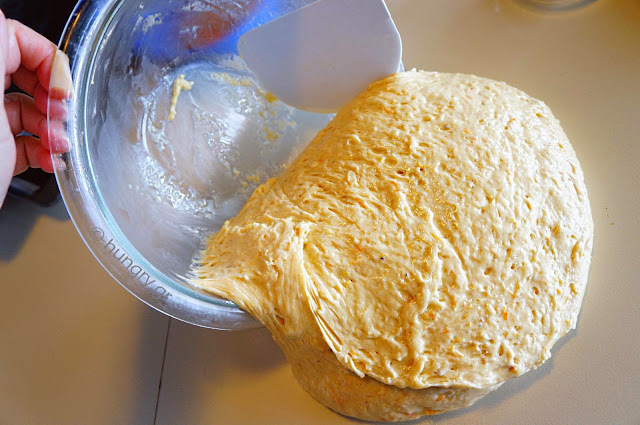 When it is ready, fold gently 5-6 times with a wide spatula, taking the dough from the sides and pulling the top from the rest of the dough towards the center. Grease a deep bowl and pour in the dough. 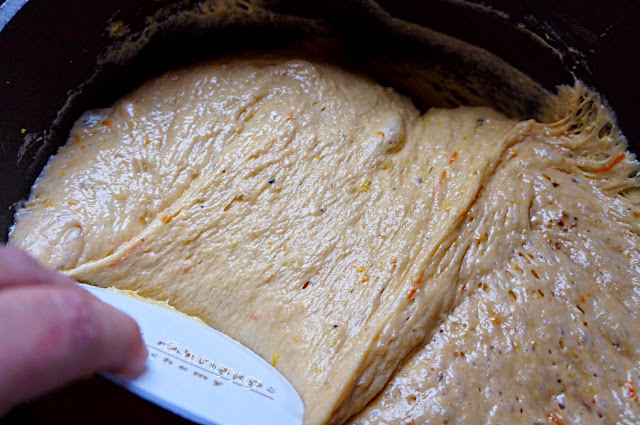 Grease the surface of the dough, cover the bowl and refrigerate until the next morning. The next morning, remove the bowl of dough from the refrigerator and pour onto the workbench well oiled with vegetable oil. Oil the hands and divide into 4 equal pieces. Knit braid or put it in the oven pans with removable base, covered with greaseproof paper. Spread it within rompers with our fingers. We leave covered a half hour to re-inflate. In a small bowl, beat the egg yolk with a little milk and brush the buns. 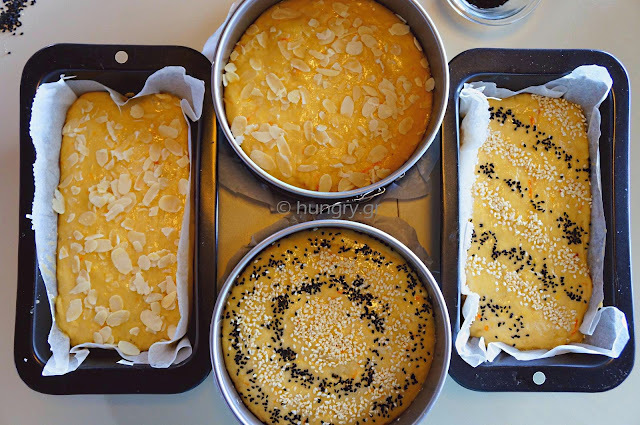 Sprinkle with almonds or sesame buns and bake in preheated oven at 170°C (338°F, Gas:3.5) for 30'-35 '. If you want to put a red egg, place it onto the buns 10 minutes before removing from the oven. Tt is still soft and sinks fine. Easter! Feast of flavor by tradition to our homes and wonderful scents in nature. A magic, an amazing combination, an uplift of the soul. 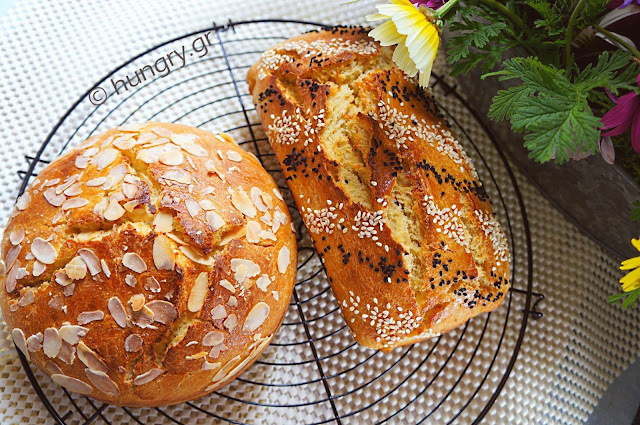 And certainly one of the most traditional dishes of Greek Easter is the unique brioche. 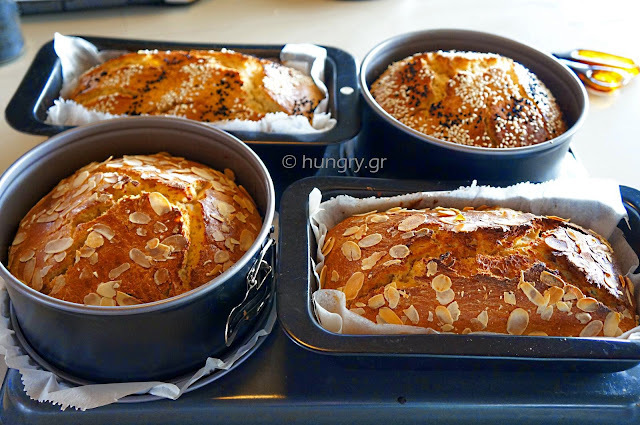 Traditional brioche of Greek Easter. 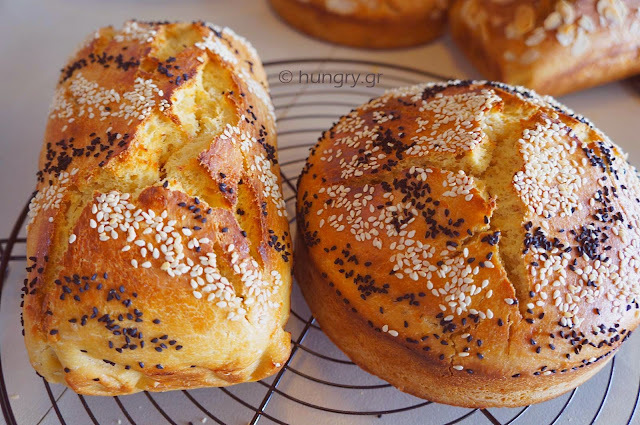 Simple process, easy way, classic ingredients and aromatics used to have a fluffy, inflatable and beautiful brioche. Everyone likes it and every Easter table should have a dominant brioche, along with red eggs, that you have prepared for this moment. 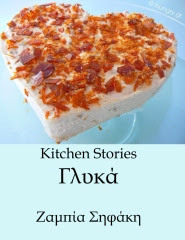 Traditional and with the rich flavor of the Greek Easter cake! 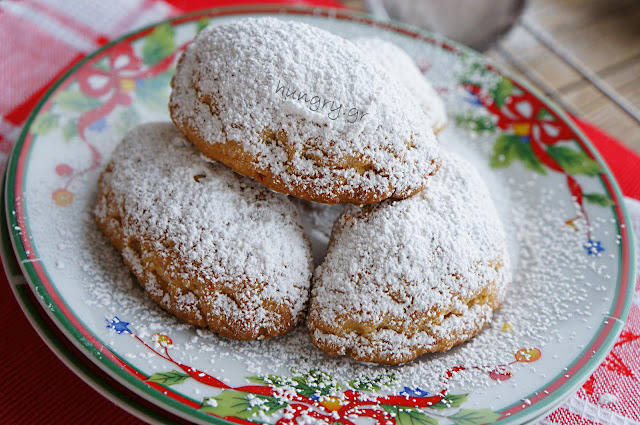 Adorned with a scarlet red egg and sprinkled with almonds. 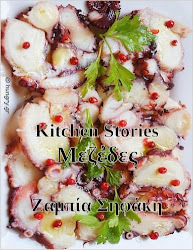 Flavored with our Chios's mastic and Mahlab, which for centuries used by the people of Mediterranean and the Middle East to produce fragrances for the food and bread.